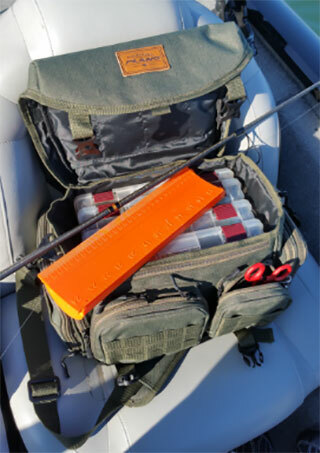 With tactical being the style these days, it is only logical that Plano’s A-Series tackle bags fit right in. The green color and lashings make this tactical-looking bag not only cool, but also do the job of keeping your plastics cool in the summer heat. The bag itself is made from durable, proprietary polyester fabric construction with a black water-resistant lining. The lashings are great and hold almost anything. The 15” X 9.25” X 9.26” bag also includes a roomy main compartment that holds four 3600 Plano storage containers. There are a total of 12 pockets for organizing, both zippered and un-zippered, with plenty of room for plastics and accessories. The front four pockets are great for those needing to quickly get to items. The quality is nothing short of Plano’s high standards and the two buckle straps did not come undone at any time, even after I stuffed it full of gear. Overall, this is a great grab-and-go bag for that day trip out on the water. The Plano quality will allow you to pass this bag down to the next generation of anglers.